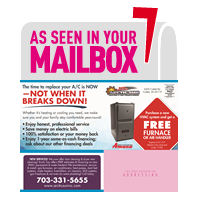 AC Repair Manassas VA | Arctic Sun Heating & Air Conditioning, Inc.
$20.00 Off Your First Visit! Have you been this satisfied with your Heating Company? "The Technician arrived on time, did quality work and cleaned up very well when the job was completed. We were so pleased with the heating and air conditioning work that we chose to employ their services to replace our Hot water heater, too. Our technician's name was Jeremy. He was very thoughtful, courteous and a joy to have in our home." When you call us, you can trust us to provide repair service to you in a very timely manner. Not only that, but we offer a 100% Money-Back Guarantee if you are not satisfied with the service we provide. So don't delay. Call us today for service or schedule online. Arctic Sun Heating & Air Conditioning, Inc., is a Virginia VA Heating, Cooling, Air Conditioning, Plumbing, Geothermal Heat Pump, Ductless Mini-Split, Fireplace and Furnace repair, service, replacement and maintenance Company located in Catlett VA and surrounding area County. Arctic Sun Heating & Air Conditioning, Inc. employs only the best plumber for plumbing repair and technician for air conditioner repair and, furnace repair as well as all air conditioner replacement, furnace replacement and boiler replacement in Manassas VA, Clifton VA, Fairfax VA, Centreville VA, Bristow VA, Fairfax Station VA, Nokesville VA, Burke VA, Woodbridge VA, Chantilly VA, Catharpin VA, Occoquan VA, Springfield VA, Oakton VA, Lorton VA, Gainesville VA, Dumfries VA, Herndon VA.. So when you ask to find "A good heating, air conditioning, plumbing repair or service company near me," you've come to the right place. To set-up a repair service estimate or replacement estimate, call (703) 331-5655. Arctic Sun Heating & Air Conditioning, Inc. services all furnace, AC, humidifier, filter, thermostat and water heater brands including Carrier, Bryant, Payne, Trane, Lennox, Rheem, Ruud, Amana, Daikin, Mitsubishi, Fujitsu, Crown, Frigidaire, Gibson, Goodman, Lochinvar, Maytag, Weil McLain, A O Smith, Kohler, American Standard, GeoExcel, General, Aprilaire, Honeywell, White Rodgers, Dynamic and Skuttle.